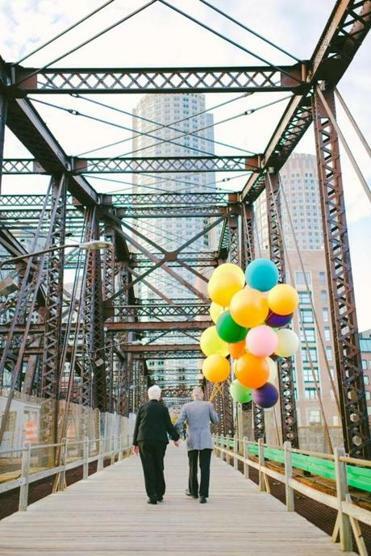 Dorothy and Donald Lutz during their “wedding” photo shoot — with a theme inspired by the Pixar movie “Up” — on the Old Northern Avenue Bridge in Boston. The traditional 60th anniversary gift is a diamond. So what do you get a couple celebrating their 61st? Boston-based photographer Cambria Grace stepped behind the lens, Caroline O’Donnell from Wild Folk Studio did custom florals, and Wells styled a colorful vignette with props from Becky Brackett’s Pop & Circumstance on the Old Northern Avenue Bridge. 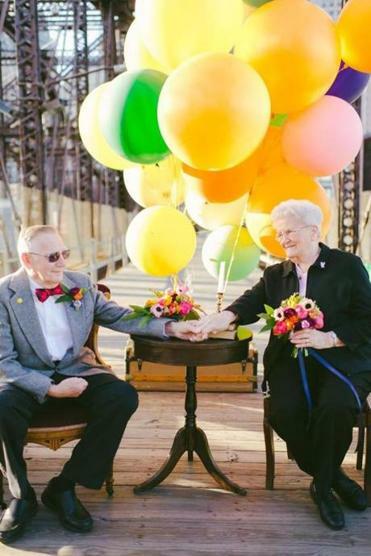 The Braintree couple, both 82, got all spiffed up and brought the charm. “I had [styled] a big wedding that weekend and the cocktail reception was in the super colorful paint room at the EpiCenter in South Boston,” said Wells. “I had blown up 45 of those giant 3-foot balloons for the event and knew we had to do something with them afterward because they were too good to go to waste. While the couple admits neither of them had seen the cartoon tale of lifelong love, the theme was picked based on Donald’s signature bowtie and smiley-face pin, a token from his days as a Brookline educator. Donald met Dorothy, then a waitress at a Randolph luncheonette, while he was on a break from the Army. The two wrote letters until Donald returned from the service, and he said he knew “pretty early on” that she was the one. Lutz tucked an engagement ring into a box of chocolates, proposed on Cambridge Common, and the two were wed shortly thereafter, on July 20, 1952. The couple settled in Randolph, where they lived and raised their family for 55 years. It was a picturesque story. Too bad there weren’t any wedding pictures. “[Dorothy] certainly wasn’t happy about it, but those things happen,” said Donald. But would something like a photographer ditching the main event fly in today’s Pinterest-driven, meticulously orchestrated wedding culture? “Probably not,” he laughed. Looking back, Dorothy recalls that — photos or no photos — she got the best gift of all that day, more than 61 years ago. Rachel Raczka can be reached at rachel.raczka@globe.com.